New year celebrations is one thing common to wherever you live in, so as Santa and Christmas lights harbingering the onset of new year. Along with "mochitsuki", the making of mochi: glutinous rice cake and exchanging "nengajou": New year postcards, one of the remarkable characteristic of Japanese new year celebrations is the traditional ritual of tolling temple chimes 108 times . 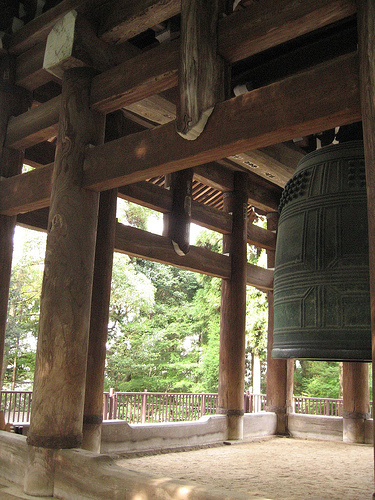 When I first saw it in the TV, last year, 108-toll of Japan's biggest bell at the famous Chion-in temple, Kyoto I could instantaneously track its origin back to India, the country where I hail from. 108 has always been the most divine number in Hinduism. Thoughts about number 108 also became reminiscent of my grandmother, who used to chime Hindu litany 108 times when I was a kid. 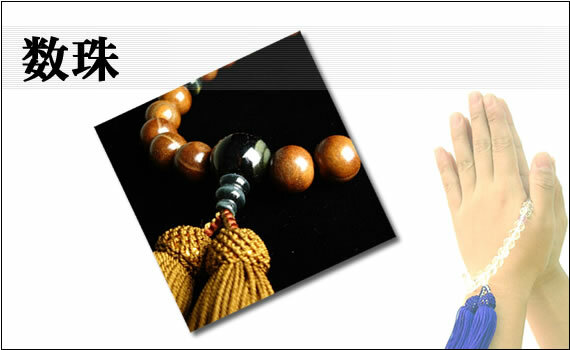 Later I came to know that 108 is a holy number in Buddhism as well, most relevant example being 108 balls in Buddhist prayer bead: Juzu. As with Juzu, one of the most famous explanation could be Lord Buddha's teaching that there are 108 earthly temptations that which an individual needs to be "Nirvana"-Sanskrit word for "to extinguish". The year-end chimes can thus be explained as extinguishing the material sins we all have done in this year, one ring being one sin, in order to make the new year, a year of enlightenment. Researching further on the divine origin of number 108, I came to know that an ancient Hindu epic 'Bhagavata Purana' narrate an instance in which lord Krishna made love with 108 'gopikas'-the sanctified cow-herd ladies of 'Vrindavan', the divine garden. As the archaeologists date back the manuscript to 3100 BC, this is obviously much older than Lord Buddha's period.Thus followers of 'Hare Krishna' sect hold 108 as a number of great significance. Lord Shiva is depicted of performing his cosmic dance of creation and destruction: "Nataraja"in 108 poses, and this is the most ancient instance where the number 108 is portrayed as divine. 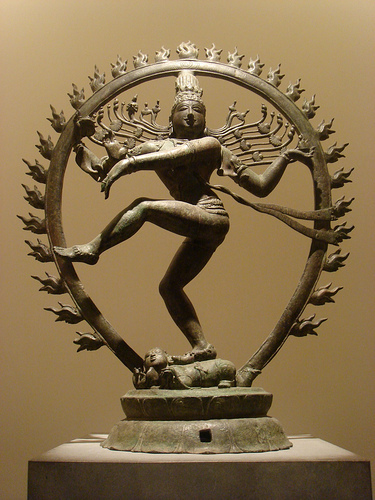 Nataraja is a well known sculptural symbol in India and popularly expressed as a symbol of Indian culture. Within Lord Shiva's dancing manifestation is represented not only all of time and space but also the primal creative force that is beyond the circle of illusion that mortals live within, all movement and vibration of the universe, and the stillness beyond all existence. Through this dance, Lord illustrate a way towards 'Moksha', liberation from the sensual universe of 108 sins. This is yet another instance I was bemused at the Buddhist identity crisis resulted from plagiarizing deep-etched Vedic concepts though the silk road. 108 is an exquisite number in mathematics, inner angle of an equilateral pentagon. It is hyperfactorial of 3 as it is in the form 1^1. 2^2. 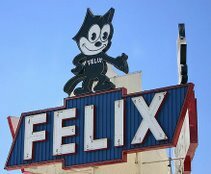 3^3. 108 is the famous 'tetranacci' number, indirectly related to the Fibonacci series (0,1,1,2,3,5,8,13...) that can be best explained by the classic illustration of Ptolemy's Pentagon. Before that, let me introduce you to the magic world of golden ratio. In Fibonacci series, ratio between any number and immediately preceding number approaches to 1.618 as you go along the series (3/2, 5/3, 8/5, 13/8...). This ratio is amazingly followed by many natural objects such as sunflower, pineapple, mapple leaves, sea shell etc. 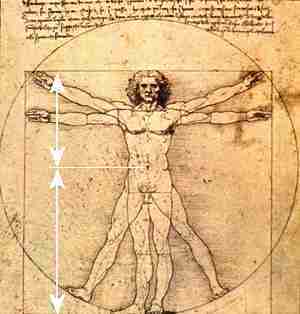 According to Leonardo de Vinci's illustration of human body, ratio between a person's height and distance between her navel and foot would also become 1.618, in perfection. There are many ancient archaeological wonders geometrically follows the golden ratio such as Parthenon's facade and Ancient Egyptian pyramids. A review about the significance of golden ratio in nature as well as ancient civilizations would be beyond the scope of this essay. Ptolemy's pentagon illustrates that ratio between any interior diagonal to any side of an equilateral pentagon is the golden ratio ie, 1.618. Thus, to relate 108 with this golden ratio directly, we need to find significance of yet another number, 5, as the only way to arrange 5 points in a two dimensional space such that each points should have minimum distance between them, is by equilateral pentagon. The godai, "five great," of Japanese tradition is perhaps best known in the West for their use in Miyamoto Musashi's famous text Gorin no sho (The Book of Five Rings), in which he explains different aspects of swordsmanship by assigning each aspect to an element .Number 5 is significant to both Buddhism and Hinduism. Excavated original Nataraja sculptures from south India are all made up of 5 metals, perhaps owing to the belief that Lord Shiva is the god of 'panchabhoothas'- the five classic elements. According to Veda, there are 5 classic elements by which we are all made up of, ie., Air, Fire, Aether (Void/Sky/Space), Earth and Water and this concept has also been adopted by Buddhism as Go-Dai (The Great Five). Major Buddhist pagodas have 5 tiers of ceiling (Gojū no Tō), each tier, naturally, represents one of the elements, beginning with Chi (earth) at the bottom, and ending with Kū (Void or Sky) at the top. Often, the spire at the top is also divided into five sections. A logical explanation why 5 became significant in ancient times could be considering the facts that we have 5 fingers and there are 5 planets naked eye can see. Relating 108 with 5 through an equilateral pentagon also obviously explains the origin of golden five pointed star, an important mythological symbol in ancient Hinduism and Kemeticism adopted by many recent sects such as Christianity and Judaism. Drawing all possible five diagonals of an equilateral pentagon give rise to the pentagram or so called 'five pointed star'. 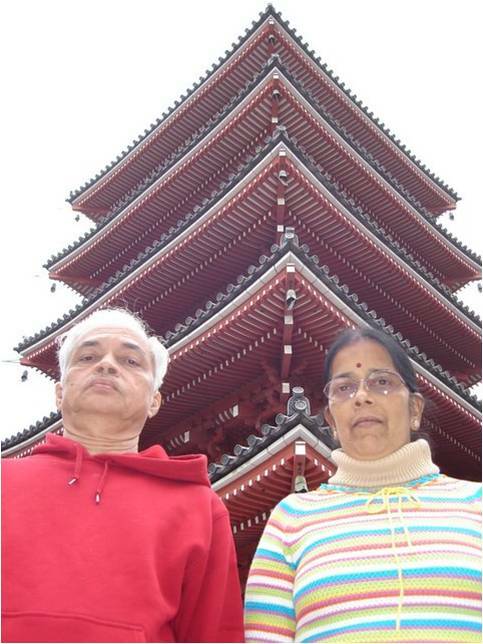 Hence, when you see 5 tiered pagoda, five pointed Christmas star and hear 108 chimes of New Year, let these musings be with you, the two classic numbers of ancient Veda, adopted by the Buddhism... an echo from the world of natural symmetry can be heard through them. Is this the way to teach kids about abortion?